Renee introduces the panel and asks them what they are looking forward to. Lawler is looking forward to the main event, Graves thinks the Divas Title match could steal the show. Renee also introduces Rich Brennan who is standing by in the Social Media Lounge. They then talk about the US Title match. Lawler says it’s not even a question; Del Rio will win. Booker T says he called Kalisto’s last win, and he’s picking him again tonight. Graves says Kalisto still has a lot to show everyone and will win tonight. Buildup for the Divas Title match between Brie Bella and Charlotte. Renee asks the panel how Brie can focus on the match with everything else going on in her life. Booker T says it will be difficult. She asks Lawler how Brie winning the title will change the Divas division. Lawler says he sees Brie losing, retiring, and having a kid with Daniel Bryan. Graves also says Brie will lose, mostly because of Ric Flair. Buildup for the triple threat number one contender match. 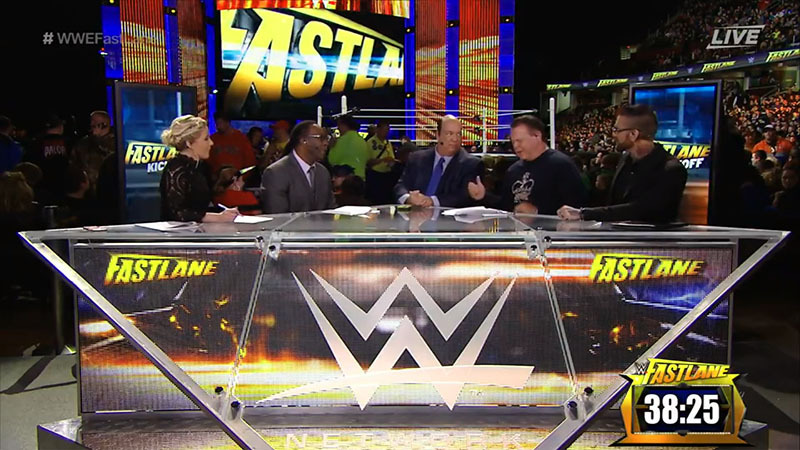 Paul Heyman joins the panel. He says tonight is just another big-money night for Lesnar. He is prepared to win. He hopes that Ambrose and Reigns will work as a team against Lesnar because that means they’ll know that one of them will have to betray the other. Lawler completely agrees with Lesnar. Graves does too. Renee Young asks Lawler who is more entertaining: Edge and Christian or New Day. Lawler says neither and talks about smashing Tiny Tim’s ukulele. Jojo asks Ziggler how confident he is for tonight. Dolph says confidence isn’t an issue. Tonight he’s going to steal the show. Lawler says Kevin Owens is going to take advantage of an opportunity tonight. Booker T says Ziggler might try to steal the show, but he needs to worry about stealing the match tonight. This was a very good match with some good psychology. The last fall seemed a little awkward in the setup, it took a while, but everything else was very good. I liked Del Rio’s plan. The beating that Kalisto took was probably the worst Del Rio’s has given him so far, so it really set up an extreme underdog victory and seemed to close this feud. I think it ended on a high note. AJ Styles answers some questions from the WWE Universe. The panel talks about AJ Styles. Graves says Jericho isn’t worried about anything. The panel talks about the main event. Booker T says Reigns and Ambrose will have to put aside their friendship. Lawler says Reigns and Ambrose will implode. Graves says that Triple H probably wants to have Lesnar in the Wrestlemania main event. Graves and Lawler pick Lesnar to win. Booker T picks Dean Ambrose.